State and local governments have a huge influence on citizens’ daily lives. They spend people’s tax dollars. They decide how schools operate and what constitutes a crime. And yet, few people seem to care these days. State and local elections aren’t drawing the interest from voters or the media that they did a few decades ago. National politics, on the other hand, is a bit like your smartphone: Even when you know that other things demand your attention, you can’t seem to look away. That’s a worrisome trend, particularly in a federalist system like the one in the United States, which gives state and local officials wide-ranging authority. How did national politics manage to crowd out state and local politics? 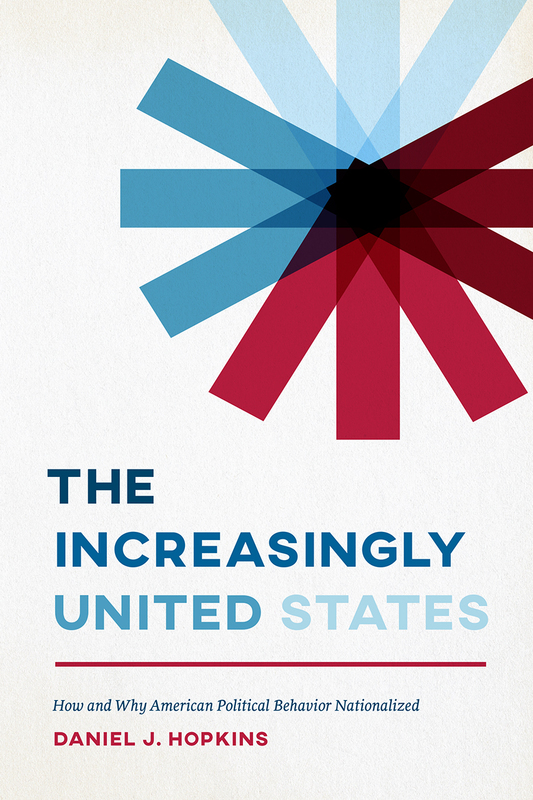 I take up that question in my new book, “The Increasingly United States: How and Why Political Behavior Nationalized.” The book considers a wide range of potential causes for and consequences of national politics’ ever-longer shadow, including its relationship with partisan polarization and its impacts on voting. In this article, though, I want to focus on just one part of the broader puzzle: the transformation of our media markets and how that affected voters’ knowledge and participation levels. It’s not exactly news that turnout for state and local races is lower than turnout for presidential races. But this pattern’s very familiarity may have obscured just how surprising it is. After all, states and localities take primary responsibility for schools, transportation and criminal justice, three policy areas that can have a major effect on people’s day-to-day lives.1 And if people were motivated to vote primarily by the idea that their vote might decide the outcome, they would be far more likely to cast a ballot in a small local elections, where their odds of being the decisive vote are much higher, than in a national one. In a federalist system, it is always noteworthy when national politics draw a disproportionate level of attention — and all the more so when the gap between national politics and state and local politics has been growing sharply. That’s exactly what has been happening in the past few decades: Voter turnout for president has remained roughly constant while turnout for state and local races has fallen. So why have these gaps in turnout and engagement grown? A key part of the answer is right before your eyes. Since 1980, the way in which Americans learn about politics has transformed — and that transformation has given national content providers an advantage over older, spatially bound media sources. A few decades ago, on local TV news or in newspapers arriving at readers’ doorsteps, the media consumer was likely to see a lot of content that was targeted to her based on where she lived. Both advertisers and editors thought about their audiences geographically, and tailored their coverage accordingly. In recent years, though, our reliance on spatially bound media sources has eroded. Cable television and the internet have introduced a host of new competitors that attract audiences based on a shared interest in politics rather than a shared geography. Consider the chart below, which uses Pew Research Center surveys to show the share of Americans who report that they regularly use different types of media to get information about politics and how those shares have changed over time. Still, how do we know that these shifts actually contribute to the growing turnout gap? 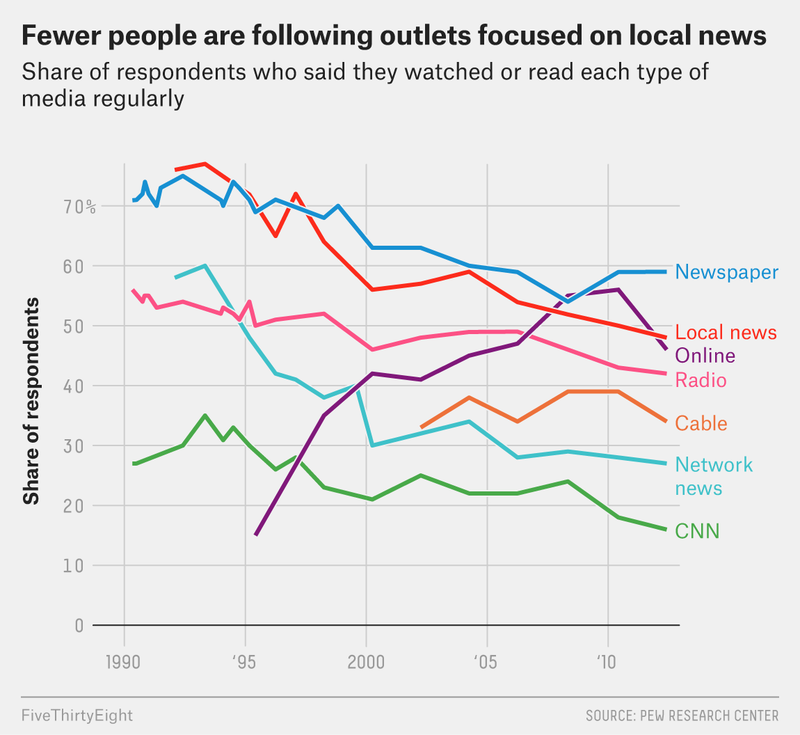 One way to connect the two trends is to look at turnout in media markets that get different levels of local political coverage. We know from prior studies2 that people who live in the same media market as their state capital have tended to get more information about state-level politics. That makes sense: It’s much cheaper to produce news about state politics from the state capital than from the far corner of the state. Gubernatorial turnout within those media markets also tends to be higher than in other parts of states. 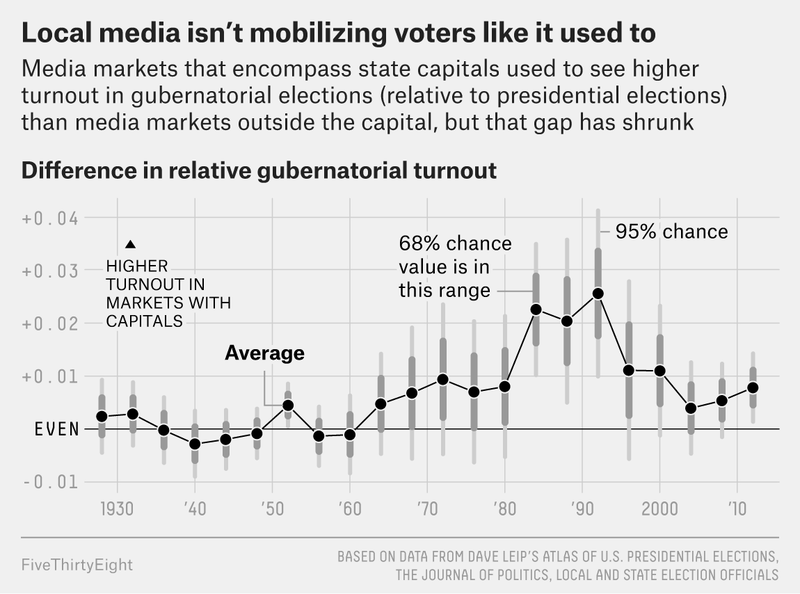 So, if citizens are in fact watching less local TV news than they used to and so are becoming less engaged with local politics, we should see gubernatorial turnout in state capital media markets decline in recent years relative to places outside those markets. In November, voters will weigh in on 36 gubernatorial elections and more than 6,000 state legislative seats. In doing so, they will shape public policy on a range of issues, from health care and gun control to marijuana and education. Given the gridlock that has stymied federal policymaking for much of the last decade, it’s a good bet that states and localities will be a major arena for public policy battles in the coming years. And yet, many media outlets compete nationally, and so face strong incentives to focus on national audiences. The result: Many of the voters who do show up to cast ballots for local races will likely do so with an eye toward national politics, and other citizens will sit the elections out entirely. Matt Garber and Sam Mitchell provided research assistance. And on their property values (if they are, like the majority of Americans, homeowners). And from other analyses in my book. Our measure here is gubernatorial turnout divided by presidential turnout in a given county, which makes presidential voting the baseline against which to measure turnout in governors’ races. So we’re simply looking for differences in the gubernatorial turnout that we see in counties in a state capital’s media market relative to other counties in the same state. Other studies consider other effects of the transforming media market, focusing on changes in the last decade. For instance, one study shows that when Sinclair purchases a local TV station, its content shifts to emphasize national politics over local politics. Another pair of studies found evidence that local newspapers are providing less coverage of politics and that citizens are less engaged in Congressional races as a result.